After months of searching - for a venue, films and more... - we are ready to launch this exceptional 22nd edition of Cineffable. Both the place and the schedule have changed because the Trianon theatre is undergoing renovation. But despite this edition being just two days long, we have managed to keep the essence intact: a proudly lesbian and feminist film festival. This year's theme is the 40th anniversary of the French Women's Liberation Movement, with a focus on lesbians' contribution to feminism. Cineffable is 22 this year, and the modern French feminist movement is 40, but how old are male chauvinism and violence against women? The 2 feature films, 33 shorts and 4 documentaries we've selected provide at least a partial answer: unfortunately, every where and at all times, it's hard to be a women, a feminist, a lesbian. Of course things aren't all bad. You're cordially invited to dance with Edie et Thea, to laugh with the Topp Twins, to sigh with the heroines of Elena Undone, and to get our your tissues for those of Viola di Mare, but still. Sin by Silence reminds that the chauvinist, hetero-normative patriarchy is still powerful and that, now more than ever, we need to raise our consciousnesses, alert the young and stay both unified and vigilant. in a word: feminist. This year's festival with a very short (s), we offer not less than 33 short films from 15 countries on four continents in four sessions. But also two feature films, Viola di Mare, previews 2011 (Monday, 8 p.m.), a beautiful Italian movie based on a true story that took place in Sicily in the early nineteenth century. To live his romance with Sara, Angela is forced to change their identity and become, for all to see, Angelo… Elena Undone (Tuesday, 8 p.m.), the new film by Nicole Conn, director of Claire of the Moon, is the romantic movie selection. The friendship between Peyton, a young lesbian woman assumed, and Elena, the wife of an anti gay pastor who has never experienced true love, is transformed gradually into a de vorante passion. And four documentaries, Edie and Théa: A Very Long Engagement (Monday, 4 p.m.): the directors of The Brandon Teena Story are back with this funny and touching documentary about a great love story. 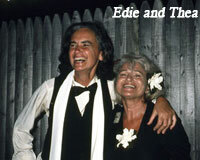 The Edie and Thea who met to 19 years at a dance and that the past 80 years, continue to dance together. Topp Twins Untouchable Girls (Monday, 10 p.m.): The Topp Twins are twin sisters lesbians feminists, country singers and comedians recognized, adored across the country. Through their journey, 30-year history of New Zealand ... in chansons.Ce feminist literature is a box when it was released in theaters in the country. Verliebt, verzopft, verwegen (Tuesday, 10 a.m.): In this documentary Agagna numerous awards, a young lesbian wondered about the history of lesbians in the years 50-60 bird, city natale.Après much research, she eventually found three women who agree to testify in front of the camera. Sin by Silence (Tuesday,2 p.m.): A moving documentary on domestic violence. The director films the extraordinary struggle of women imprisoned for life for killing their abusive husbands, who are fighting to help other women break the cycle of violence. Subject: presence of the director and one of the presenters of the documentary. 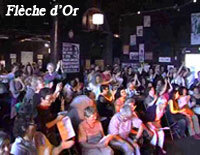 The year 2010 has seen a number of events honouring the 40th anniversary of the founding of the MLF, the Movement for the Liberation of Women in France. This edition of Cineffable will also be looking back over the struggle, with a focus on lesbians. Discussions; tributes; individual, selfservice screens providing access to videos from the 70s to today; an expo; a screening dedicated to Carole Rossopoulos... and this special MLF anniversary screening are some of the highlights of the celebration. Two hours couldn't possibly suffice for an in-depth look at 40 years of struggle, debate, actions and dreams, but we hope these images - ranging from the first modern feminist march to the anniversary festivities, last June - will stimulate memories and re-energise everyone. We have also saved a special place for a radical lesbian who was essential to our history as feminist lesbians: Michèle Causse. 40 years of MLF, lesbians' historic contribution, a mini-conference based on the posters from Press Movement: 1970 to the present - feminist and lesbian struggles by Michèle Larrouy and Martine Laroche. With Michèle Larrouy, Martine Laroche (unconfirmed) and Suzette Robichon, discussion and guided tour. Monday, November 1 - 4 p.m.
Qui a peur des Amazones ? Mariages forcés, plus jamais ! will be available to guide you. 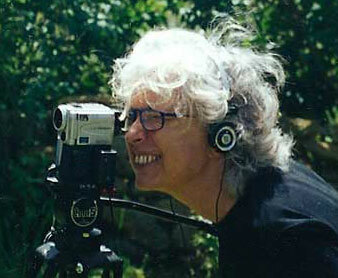 Video pioneer Carole Roussopoulos shot some hundred-odd documentary films from 1969 to 2009. With a militant video-camera in her fist and a microphone reaching out to those whose voices are never heard, she accompanied and illuminated the various protest movements and struggles of the 70s - anti-imperialist, pro-workers' rights, gay rights, and above all, feminist - with intelligence, enthusiasm and humor. She sometimes worked alone and sometimes as part of a collective. 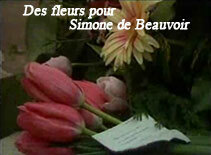 In 1982, she, Delphine Seyrig and Iona Wieder founded the Simone de Beauvoir Audiovisual Centre, an audiovisual production and archive centre dedicated to women, for which she directed a number of documentaries about women's history. From 1984, she pursued her combat through her production company, Video Out, giving those who are seldom heard - the disadvantaged, inmates, drug addicts and others - a chance to speak. After returning to her native Switzerland in 1995, she went on to address other issues that are rarely documented and hard to finance: the elderly, hospice care, organ donations, excision, forced marriages and more. For this special "Tribute to Carole Roussopoulos", Cineffable presents 3 of her films from different periods, preceded by excerpts from a "Cinema Lesson", an intimate interview she granted at the International Women's Film Festival in Créteil, in 2000. In this "Lesson", Carole Roussopoulos takes a brief but exhilarating look back over her career. Corps de parole : « J’existe au nom de tout ce qui n’a pas eu lieu ». will present works by Michèle Causse. Qui a peur de Valérie Solanas ? À quelle heure est la levée dans le désert ? Michele Causse graduated translator at the University of Paris (Sorbonne), taught briefly in Tunisia, lived ten years in Rome where she studied Chinese and wrote an essay on the status of concubines, maids-in-courtesans Ming novels (unpublished). 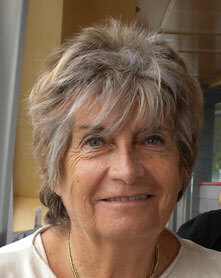 Back in France, she wrote "L'encontre" which Monique Wittig was the first reader. She lived for eight years in Martinique and writing on behalf of the Ministry of Women's Rights study on ethno-social stratification of women in Martinique, then in the same island, "Lettres à Omphale" and "( )". A briefly lived in New York where she met Djuna Barnes, Jill Johnston, Catherine Stimpson, Joan Nestle, Kate Millett. Michele Causse has been a visiting professor at Rome (chair of Adult Education), consultant to UNESCO (Department of Literacy, where she used the methodology developed by Alice Ceresa "Unit library"), a visiting professor at Montreal at Concordia University. She has translated from English and Italian thirty novels (Melville, Gertrude Stein, Djuna Barnes, Mary Daly, Silone, Pavese, Natalia Ginzburg, Alice Ceresa, Luigi Malerba, etc..). All his work continues under a single "bring about the language point is born" in a search does not dissociate the writing of his theorizing. Michele Causse leaves 3 new works to be published: two novels "Défigures du soi" and "Les belettes et les boas", and a theoretical text wrote with Katy Barasc, philosopher: "Requiem pour ils et elles : les Sapiens ou la fin d'une imposture", a reflection on the conditions of possibility a new figure of justice by failing sapiential categories of description/prescription assigned to any living subject.